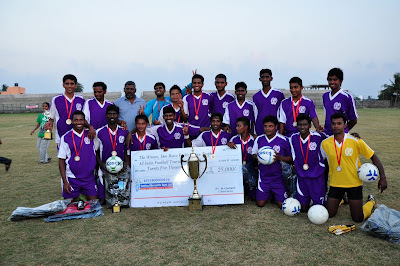 Displaying a stellar performance, BDFA XI defeated local outfit Arrows FC 3-1 and won the Don Bosco - Fr. Mcferran Trophy. BDFA XI had earlier won the tourney on 2006, they were runners up on the 2008 edition. BEML striker Stephen scored a brace in the 10th and 85th minute and MEG striker N Hamar scored the other goal in the 29th minute of the match. S Gilberd reduced the margin for Arrows FC in the 62nd minute. Winning this prestigious knock-out tournament, BDFA XI bagged a cash incentive of Rs.25,000/-. In the best player’s category, Chethan Kumar bagged the title of best defender and Stephen was adjudged the best attacker.